Gabe and me at Dork Camp in summer 1998. (with evidence that our friend Steve, right, was a photo bomb pioneer). 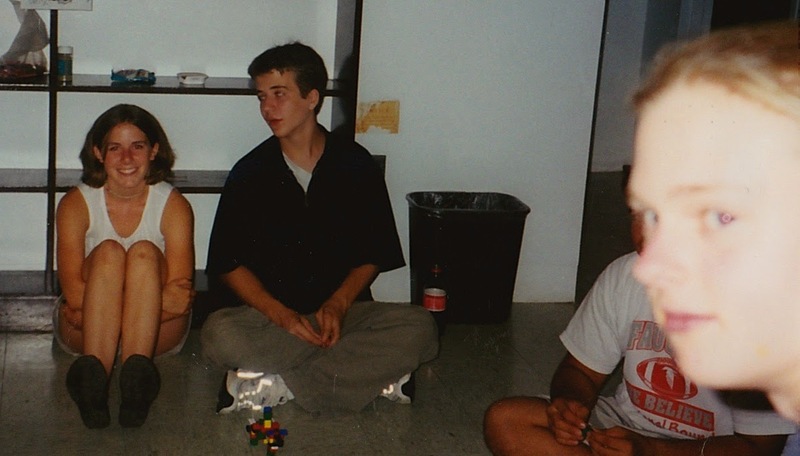 The summer before my junior year of high school I went to a summer camp for nerds at UVA where I developed a small crush on a boy named Gabe. Although there were no romantic interludes on the four-square court or even in the dorm common areas, where Gabe and his friend Steve would engage in endless rounds of Mega Block Toss, I gave Gabe a ring at the end of our two-week stay. It was a ridiculously sentimental display -- maybe I hoped it would be insurance that we'd see each other again or that it said, without me actually having to say it, that I like-liked him, not just liked him. My 16-year-old self was prone to these awkward gestures toward boys. Of course, my 32-year-old self is mortified by this moment. No 16-year-old boy wants to be responsible for a ring from a girl he's only known for two weeks and who's already shown stalkeresque inclinations. But Gabe took the ring graciously. And, as is the case with most 16-year-old boys who've been left with the responsibility of tending to rings left to them by fawning 16-year-old girls that he only had a passing interest in, he promptly lost it. He confessed and I realized that he just wasn't really into me in that way. Which was fine. Really! We didn't live all that close to one another anyway, and I was just as happy to count him as a friend. Today Steve sent me a message on Facebook. Gabe passed away suddenly after getting the flu. He's left behind a wife and three small children. It's strange processing this information. I haven't talked to Gabe or Steve in more than 10 years. The news of his death was immediately sad and shocking. He's so young and his poor wife and babies. It seems unjust and wicked. Why? Why? And now I can almost see my brain flipping through the endless rows of file folders, searching for the one labeled "Gabe" which inevitably leads to the one labeled "Steve," because they were close friends back then and we were friends, too. There's this primitive urge in me to recount that story -- however short it is. The one where we're all 16 and 17 and I'd drive to Falls Church every few months to hang out in Steve's basement and trade jokes and watch the boys play video games while listening to "Hello Nasty" by the Beastie Boys. I'd make fun of Steve's cat whose flattened face made him look as if it'd run into a brick wall. What was that cat's name again? Gabe and I went on just one date. We went and saw "What Dreams May Come" at the movie theater. I had to get up and leave part way through the movie because there was a line in there "All suicides go to hell" and an acquaintance of mine from high school had just killed himself and it was too awful to think about such a kind-hearted soul being in such a terrible place. Poor Gabe had no idea about the death and was probably befuddled by my sobbing, but I remember he was kind and consoling. He didn't think I was weird or over-emotional (and if he did, he didn't show it). Another time Steve and him ventured out to the "country" (really the D.C. suburbs where I grew up) to hang out in my basement. My friend Becky joined us after having a terrible time at a party thrown by some of our school's more popular kids. The four of us spent our Saturday night constructing an elaborate Lego House of Doom -- and it was a perfect evening -- uncomplicated and silly. One time we were all talking about what animals we were the most like -- they agreed that my spirit animal(s) would be a koala riding on a golden retriever's back. It's funny because it's true. I won't pretend that we all developed a lifelong friendship or that we were anything more than small blips on the radars of each other's lives. After high school was college and after college, jobs and families and we all lost touch and I'm left with nothing save for a few photos and some fond memories. We cross paths with so many different people in a lifetime and each leave impressions large and small. Today I'm grateful that my path crossed Gabe's and Steve's that summer at UVA. I might have lost a ring, but I gained two friends and the boost of confidence that comes when people you think the world of respect you back. I'm so sorry for the Ruth family's loss. And Steve and the rest of the guys, too. I haven't seen an obituary for him yet, so I wanted to contribute my small footnote to his story. Gabe was a great person and I'm proud to have known him. *Strangely enough I'm reading "The Interestings" right now, which deals with these very topic: The people you meet in life who value you for you and make you feel like a stronger person because of it. There are certain moments, often when we are young, that our hearts are completely open. A such times, another may touch us in ways we never forget. I had such a moment, too.